Irem Madigan’s wedding trip to Rome turns into a desperate search for an archaeological prize, and a struggle to stay ahead of a killer. Set in and under Rome, The Bone Shroud is a love story wrapped in a perilous relic-hunt. Irem flies to Italy to be the “best man” in her brother’s wedding. He’s marrying an archaeologist bent on revealing the graves of some famous ancient dead. Irem, an archivist at the Chicago Field Museum, becomes obsessed with the centuries-old mysteries. Unfortunately, Irem discovers there are other players in the game, and some of them are playing deadly. Can she survive and uncover the ancient secrets? Jean Rabe is the author of three dozen novels published by small and major presses, has been on the USA Today bestseller’s list, and is a former crime reporter. Jean lives in a tiny town in central Illinois that boasts a gas station, Dollar General, and a pizza place with slow service. She writes with dogs wrapped around her feet while listening to the “music” of passing trains. She is active on Facebook and Twitter, blogs, and maintains a website: jeanrabe.com. She is a member of Sisters in Crime, the International Thriller Writers, and the International Association of Media Tie-In Writers. I have a newsletter filled with tidbits about my upcoming books, reviews of things I’m reading, and writing advice. You can subscribe here. Irem Madigan is in Rome to celebrate her brother, Levant’s wedding to archeologist Benito. But Benito has almost deciphered the clues and is a stone’s throw away from discovering the tomb of Attila the Hun. He believes Attila’s shroud could lead to graves of other people. But he is not the only one looking for Attila’s tomb. Many others want to reach it first and will do anything to make sure that no one else gets in their way. This is a fast paced, adventure from the start. I loved the location and the description. I could feel myself in the dank, tombs alone side Irem. But this is not just a cut and dry, follow the clues and find the prize kind of story. Who is Benito really? When Irem sees him making a shady deal and finds herself being shot at it’s easy to see how Benito might not be the perfect person Levant has come to love. This is a great story that is just as good as Dan Brown or Clive Cussler. If you like the scavenger hunt through time with so much more added, look no further. 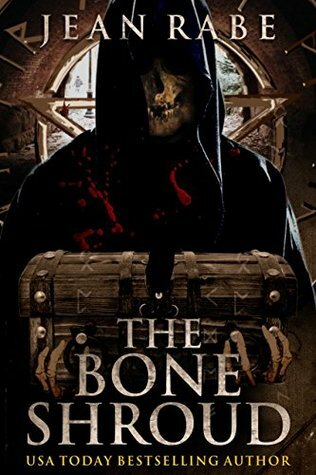 The Bone Shroud is the book for you. I would like to thank Let’s Talk Promotions for the opportunity to read and share this book. The tour giveaway is for a 25.00 gift certificate or a fused glass necklace. Irem winced. Kartal-Madigan? Their last name was Madigan. Their mother’s maiden name was Kartal. She supposed Kartal-Madigan sounded exotic, something an artist would embrace. He had a working man’s hands, the fingertips rough. He took a polite step back. The slight woman who’d been gazing at the cloth smiled wider. Young, plain-looking, no makeup, her only jewelry a simple cross on a long silver chain. Maybe his daughter. “Irem. That is Turkish, correct? It means ‘garden in heaven,’ I believe,” Hamadi said. “The wine is just as my brother says, Mr. Shamoon. Exquisite,” Irem said. Irem took another picture of the quartet as they retreated. Irem took Levent’s picture next to the shroud.